How to get last modified date of given file in Java? Home Basic Date Questions Basic File Questions Questions using library methods How to get last modified date of given file in Java? Write a program in Java that prints last modified date of given file. How to get last modification date of given file in Java? It is more simple than getting file creation date of given file. We just need to use following method of File class that is present in java.io. * package. public long lastModified() - It returns time in milliseconds, we need to convert this time into Date. How to convert given Date to String ? How to convert given String to Date ? * @problem How to get last modified date of given file? //file is present in current working directory. // Convert Date to String. Output - How to get last modification date of given file in Java? 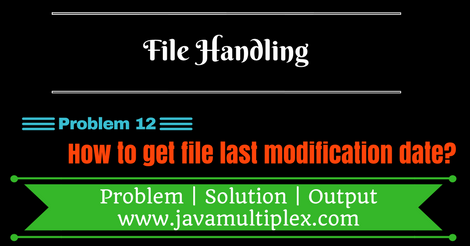 Tags : File Handling, file last modified date/time, if else, Scanner, String, File, Date, SimpleDateFormat(), exists(), Regular expression, lastModified(), java.io.